With a code-breaking design to streamline performance the IS6300 Master Valet Garment Steamer is ideal for steaming garments and furnishings around the home. Comes with a fabric brush for ideal steam penetration and crease removal on thick fabrics, a lint pad for removing lint and pet hair and a steam cap that facilitates distribution. The exclusive Roll and Press System provides a vertical support like an ironing board to press clothes against while steaming. 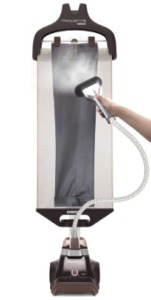 While steaming you will experience the powerful and continuous steam output, that allows the steamer to de-wrinkle, sanitize, and remove odors giving you professional results. Once you have completed steaming simply turn the unit off with foot operated on off switch (no bending necessary). Store this unit easily by tilt and go wheels system, and if you are battling for space, simply depress the telescopic roll and press system. Ready to steam in just 60 seconds! 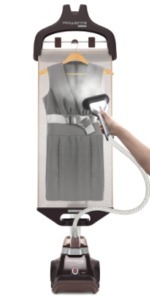 Telescopic Pole with built-in hanger Designed with the user in mind, the built-in hanger makes steaming garments like shirts or dresses easy. Pole height is adjustable for comfort and is also collapsible providing easy storage in your home. Profiled telescopic pole adjusts height for comfort and pushes down for compact storage. Foot operated on/off with indicator light is designed for comfort and ease of use. pull down the Roll & Press System for effortless one-handed steaming. 2.4 liter removable water tank holds up to 1 gallon of water for up to 2 1/2 hours of prolonged continuous steam. You can refill the lightweight tank anytime during the operation simply by detaching it. Accessories for perfect results on your garments Comes with a fabric brush for ideal steam penetration and crease removal on thick fabrics, a lint pad for removing lint and pet hair and a steam cap that facilitates distribution of steam and protects delicates from water droplets. Profiled telescopic pole adjusts height for comfort and pushes down for compact storage. Exclusive Roll & Press system provides vertical support similar to an ironing board, allowing for clothing to be pressed while steaming, optimizing the ergonomics and improving efficiency. Large built-in hanger for shirts and jackets. Adjustable, rotating clips for pants and skirts. 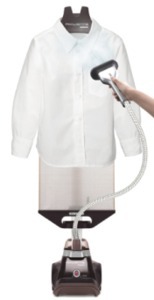 Steam your garments right on their own hanger with the integrated hanger hook. Suitcase inspired “Tilt & Go” feature enables easy transport.